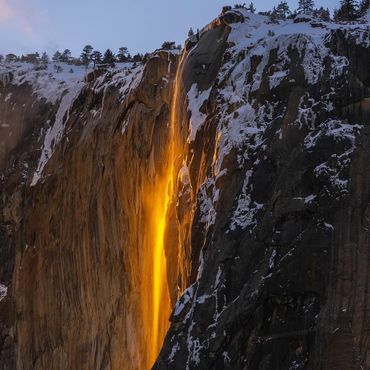 "For just a few days every February, the setting sun illuminates Horsetail Fall, making it glow like a cascade of molten lava. Horsetail Fall only flows in the winter or spring when there is enough rain and snow. It occurs for just a few days each year in mid-winter. It takes place when the sun remains low in the sky and the orange sunset hits the waterfall at such an angle that the water appears to glow with the reflection. While the phenomenon occurs each year, it does require weather conditions to be perfect. There has to be enough snow gathered at the top and temperatures have to be warm enough for the snow to melt and fall 1,570 feet down the eastern face of the rock formation during the brief window of time when the sun is in position. The sky has to be clear as well because any clouds or precipitation would prevent the sunlight from bouncing off the water." Seen this on the news. Stunning.